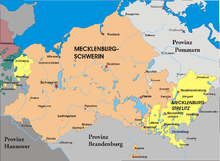 The Duchy of Mecklenburg-Strelitz was a duchy in northern Germany, it was about the same as the modern rural district of Mecklenburg-Strelitz. The duchy also had three exclaves near the town of Fürstenberg and the area around Ratzeburg in modern Schleswig-Holstein. The Duchy of Mecklenburg-Strelitz was set up in 1701. The capital was Neustrelitz. In 1808, the duchy joined the Confederation of the Rhine. The Congress of Vienna made it a grand duchy and member of the German Confederation. Mecklenburg-Strelitz joined the North German Confederation in 1867, and became a part of the German Empire in 1871. On January 1, 1934 it was joined with the neighbouring state of Mecklenburg-Schwerin to form the State of Mecklenburg (today part of the federal state of Mecklenburg-Western Pomerania). The US county Mecklenburg (Charlotte, North Carolina) is named after Mecklenburg-Strelitz and Strelitz-born Princess Charlotte (queen consort of King George III of the United Kingdom). The flower Strelitzia ("Bird of Paradise") also is in honor of her home country. Queen Luise of Prussia also was a born princess of Mecklenburg-Strelitz. This page was last changed on 11 December 2018, at 18:36.